President Donald Trump addressed supporters in Charleston on Tuesday evening during a Make America Great Again rally. Trump, joined by Governor Jim Justice and U.S. Senate candidate Patrick Morrisey, spoke about endorsements (he has endorsed Morrisey), Supreme Court nominee Brett Kavanaugh, dismantling Obamacare, Senator Joe Manchin’s voting record, progress on building the wall and much more, during his address at the Charleston Civic Center. 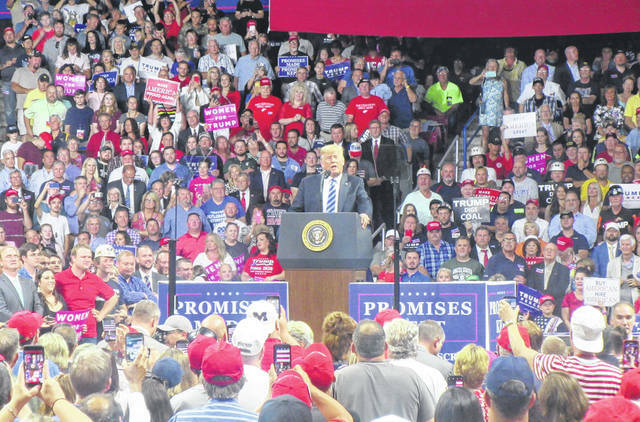 A full story on Trump’s visit to Charleston will appear in the Thursday print editions of The Daily Sentinel, Point Pleasant Register and Gallipolis Daily Tribune.